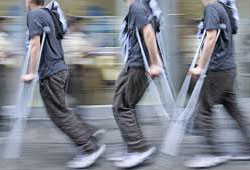 The term Orthopedic Injuries applies to the injuries of the bones, joints, muscles, ligaments, and tendons that an individual can sustain as a result of Motor Vehicle Accidents, Slip & Fall Accidents, or other accidents. As a result of Slip & Fall Accidents, a person usually sustains closed fractures of upper and lower extremities, as well as a hip fracture as a result of a bad fall on a hard surface. As a result of Motor Vehicle Accidents, a person usually sustains open fractures of upper and lower extremities of different levels of seriousness. Any Orthopedic Injury can cause pain even after recovery. The fractures and broken bones can also cause Chronic Pain. After Orthopedic Injuries a lengthy rehabilitation is required, including massage, physiotherapy and chiropractic treatment. More than that, as a result of the initial Orthopedic Injuries, secondary orthopedic diseases can develop, such as arthritis, arthrosis, damage to ligaments, and degenerative changes of the musculoskeletal system. If an Orthopedic Injury has happened to you, your relatives, or your friends, urgently call SLOMYANSKI LAW at 416-519-1006, or send a fax to 647-340-2899, or complete the form on our website in order to get a free consultation. You pay only after you receive compensation.